Cats also have an unfortunate tendency to explore new places, like the back of pick-up trucks and they often get accidentally carried off. Consider whether there were any vehicles around that your cat may have hitched a ride on. 2. Notify your local animal control agency or the police. If your cat has a chip, let the microchip company know your cat has gone missing. Police or animal control are often the first place people call when they have found a stray pet in their neighborhood. Ask that they keep a written record of your lost pet. Hours: Office Hours Mon,Wed,Thu,Fri 9 a.m. – 5 p.m.; Tue 9 a.m. – 6 p.m.; Sat. 9 a.m. – 3 p.m.
Decatur Animal Services is open Monday through Saturday. 3. Comb the neighborhood on foot and by car as soon as possible and keep looking. Get permission and check all yards within a five house radius. Bring a carrier. Calmly call your cat by name or make some familiar and attractive noise, like rustling a food bag, or shaking a can of treats. Remember that a frightened or injured cat will hide and may not come to you. Pause often and listen. Look under porches, behind bushes, under cars, etc. Ask neighbors for permission to look in their yards. Most cats are recovered close to home. Another possibility is that your cat has become trapped in a neighbor’s garage or shed or on a construction site. Look also in trees and on rooftops. Bring a flashlight to examine dark places. The best time to look and call is early morning and late evening when there is not much activity. Take along a photograph of your pet to show neighbors and people who know the area: letter carriers, meter readers, school bus drivers, joggers, neighborhood children. Hand out cards or flyers with a picture and information on how to contact you. Most cats won’t go too far, and are probably hiding close by. Go out after dark with a flashlight. Shine the flashlight up onto rooftops as well as down into all hidden recesses and look for the distinctive reflection from the eyes. 4. Scour lost and found cat information on the web! A. Search the Found Cat reports on Pet FBI and post a Lost Cat report. We have had many same day reunions because the pet owner and the Good Sam both used Pet FBI right away. But there are many other lost and found pet databases on the web. Only a few are non-profit and national in scope. Please consult our page “Other Online Resources” for suggestions. The Pet FBI database is possibly the oldest (set up in 1998) and the largest, but information about your lost cat may very well be somewhere else. Craigslist free classified ads have all but supplanted traditional print ads. Post and check Craigslist and keep checking! Select your area, then “Community” then “Lost + Found”. The “lost and found” is for everything, not just pets, and the ads are organized by the date they were posted. It is also possible to see a map with pins indicating the location of lost or found pets if the poster uses that feature. As of this writing, Craigslist ads expire after 45 days. Users can renew a lost cat ad every 48 hours to keep it towards the top. It is possible to search by key words like “ lost black cat”, but it may require some persistence to view all the relevant information. However, Craigslist has the advantage of being widely known and used. When using Craigslist to search for a lost cat, you should also check the ads for areas beyond your own, because lost cats sometimes turn up far away. C. Facebook: Create a blast from your page! Also research lost and found pet Facebook pages and post. If you have a Facebook account, tell all your local friends about your missing cat and ask them to share. Many Facebook pages are dedicated to lost and found pets. to find them use the Facebook search box and enter “Lost and Found cats [your city or state]. You can even try to be more specific, like the Columbus Ohio woman who lost her dog and keyed in “Found Pomeranian Columbus”. The results took her to a new post about a found Pomeranian on the Pet FBI Ohio Facebook page and it was her dog! The disadvantage of using Facebook is that first you must be a registered Facebook user to post or to search. To avoid the bother of setting up your own Facebook account, you can always ask a neighbor’s kid or practically any young person to help with Facebook. Another drawback is that Facebook posts are not efficiently searchable. You have to magically hit the precise search terms or plow though all the posts looking for the information you need. CAUTION! There are many fee-based lost and found pet sites online. You can find them easily enough by using a search engine like Google and entering “I lost a cat”. Most of the search results will be commercial businesses. Some can be truly helpful, but too many others are just out to make a quick buck. We recommend that you chose carefully if you decide to pay for a commercial pet recovery service. Research independent reviews and check with the Better Business Bureau where they are located. Be wary if they operate under several names, This is a way of dodging a bad reputation. Do not be taken in because they display a logo from a well known organization or have appeared on TV. Some will have databases that you can search for free but you have to pay to post. Some offer contact services like making robo-calls or sending emails or faxes to local shelters. Some will do postcard mailings. Postcard mailings are pricey but if your cat has been missing for awhile it may be worth the expense. Robo-calls however are rarely effective. They cannot possibly reach all the people in your area who use only a mobile phone. In any case. you really need to visit shelters often and in person. Do not be lulled into doing nothing because you have engaged a service. Include a picture and description of the animal, date lost, and how to contact you. This is one of the most successful techniques. Be sure the letters are large and easily visible from a passing car. For your convenience, we have prepared a flyer template. You can click on this link, key in your information and it will automatically format a printable flyer. Have copies of your flyer made on light, bright colored paper. Include a photo if possible. In addition to printing and posting as many flyers as is practical, we recommend that you make a few special posters to use in the most strategic places. Mount some of your flyers on fluorescent poster board. Use an indelible marker to write LOST CAT, and your phone number in large dark letters and put sheet protectors on your flyer. (Most supermarkets sell poster board in the school supply aisle). Post the signs and flyers in conspicuous places like utility poles, intersections, bus stops, nearby schools, laundromats, community bulletin boards, vets offices, etc. 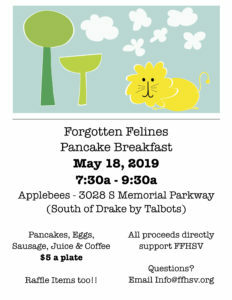 Most lost cats are found fairly close to home, but some turn up miles away, so it is equally important to post the flyers at some major intersections in other parts of town. Cats are sometimes “spirited off”. You can’t post too many flyers! It is also a good idea to hang your flyers from doorknobs in your neighborhood. Again, distribute them as widely as practical. (Please note that it is not allowed to put anything other than US mail in mailboxes.) One Pet FBI user suggests taking copies of your flyer to the local post office to post by the time clock so the carriers in the area can be aware. This may not be possible at all post offices. Hair salons are also a good place to post and network. Another good tip is to tag your car but be sure to check with the local police to see if there are any restrictions for doing this. 6. Try to attract your pet back to the house. In our experience, many cats make their way back home eventually – sometimes long after they have gone missing. Here are some tips to lure them back home: Use your other pets to leave a scent trail to and from your house. Leave strong scented articles outside like worn clothing or pillow cases, your cat’’s bedding or mat or litter box, or some fragrant food, taking care that other animals don’t eat it. If at all possible and/or safe and practical, leave a window or a door open so your cat can get back in on their own time. For more tried and true tips please read our page of tips and tricks to lure a cat back home. If you suspect your pet is around but not coming to you, a good trick is to sprinkle flour and check for paw prints. You might try setting up a video camera. 7. Consider setting a humane trap. Once you confirm the cat is around but resists coming to you, you may need to try trapping with a humane trap. Inside cats that “escape” to the outdoors are very likely to be hiding close by. Their instinct when frightened is not to reveal themselves, so they will not meow or come to you. The only way to get a nervous cat back may be to trap it. Some local humane societies and animal control agencies will lend or rent humane traps. They can also be purchased at pet stores, hardware stores and home centers. Bait with some strong-smelling food. Monitor trap often. If left overnight, do not be surprised if you catch a raccoon or someone else’s cat! 8. Visit local shelters and humane societies immediately and return often. This is the hardest thing to do, both physically and psychologically. In most states there is no mandated holding period for cats as there is for dogs. You may have to look at all those little faces knowing they could be doomed. Of course there are shelters that do not routinely euthanize but they are usually full and have to turn down people who want to surrender a stray. Still it is indispensable to visit your local shelters in person to see if your cat has been turned in. Bring a good photograph of your pet to leave with them. but do not depend on the shelter people to contact you. Often, they are just too overwhelmed to research the huge volume of lost and found cat reports they are asked to deal with. You really need to return to the shelters regularly to look for yourself. All content in this site by Pet FBI copyright (C) 1998-2016. 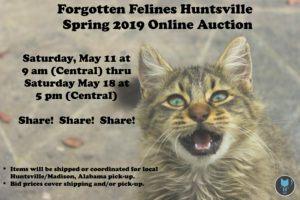 Create an account on AmazonSmile and designate Forgotten Felines, Inc. (Capshaw, AL) as your non-profit of choice. Thank you!